Juliette pioneered the concept of Natural Rearing back in the early part of the 20th Century and so her methods have been proven over numerous generations of dogs; Juliette talks of dogs routinely enjoying lifespans of around double those that we accept today (i.e. dogs living into their late teens and twenties) and, just as if not more importantly, disease-free lives. Her book primarily covers diet (what to feed and why), and the use of herbs (both as nutritional support and as remedies for ailments); it also touches on alternative therapies and the dangers of conventional vaccinations. Many of the more recent publications on raw feeding were founded on Juliette's work. Another useful book on canine nutrition and complementary therapies, based on the principles of Juliette de Baïracli Levy. Very good for getting started as it contains a "menu" with specific amounts based on the weight of the dog. Test your dog's faeces simply and cheaply, to avoid unnecessary worming. Contains lots of useful information on feeding naturally in practical terms, alternative therapies, vaccinations, as well as the horrors of what goes into pet food. Also a supplier of useful products. 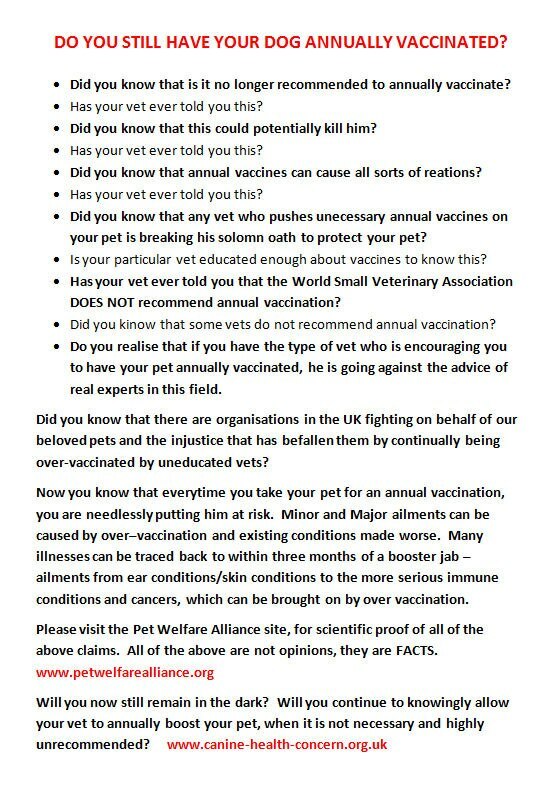 Organisation founded by Catherine O'Driscoll to campaign against over-vaccination and promote naturally healthy dogs, useful source of information. A useful guide to raw feeding for beginners (but please bear in mind that Estrelas need much less food for their size than most other breeds, we find 1.25% of their ideal body weight to be about right as a daily maintenance amount for an adult). Homeopath: compassionate holistic healing for people and animals, for learning about using homeopathy for your own pets for common ailments and vaccination alternatives. The BAVH is a UK-based, non-profit organisation representing the growing body of vets using herbal medicines to treat animals. Use this page to find a herbal vet near you. Veterinary Surgeries offering veterinary homeopathy in the UK. Note: this list is not exhaustive. Another site which enables you to search for a homeopath near you, whether it be a homeopathic vet, doctor, dentist, midwife, nurse, or other kind of practitioner that you are seeking. Roger Meacock: holistic vet for people and animals!